Posted by skyvu on Tuesday, May 15, 2018 in News, Reporting. 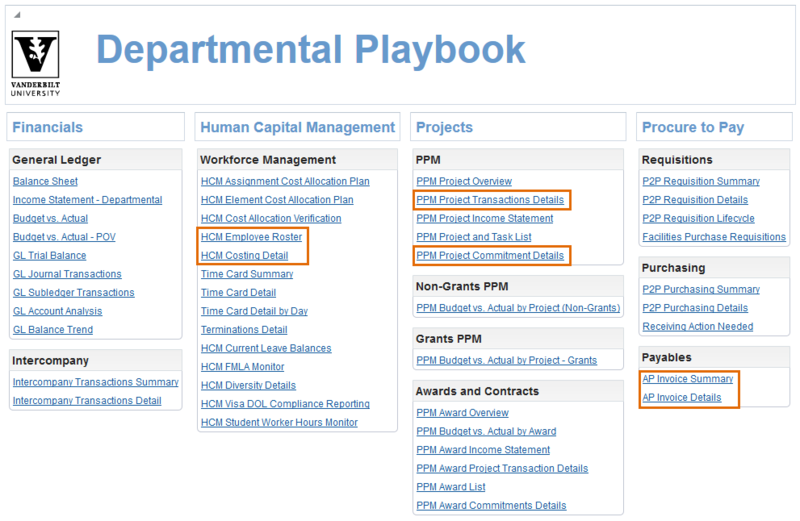 The HCM Costing Detail report is now available in the Departmental Playbook. This report provides you the ability to download detailed payroll data by Person, Business Unit or Department. The HCM Employee Roster report has been enhanced to include salary information for your designated area of responsibility. The AP Invoice Summary report has been updated to provide better reporting of invoices related to projects for Financial Unit Managers and Data Analysts. In addition to having the Project Number and Project Name in the prompts, the report now includes columns displaying the project’s Organization, Expenditure Type and Task. These updates will also aid in reviewing Purchasing and Expense details charged to projects in your areas of responsibility. The AP Invoice Detail report has been updated to display payment status details. We have added a new prompt for Accounting Date to the PPM Project Transactions Details report. This report may now be run by either Expenditure Item or Accounting Date. We have also added the Accounting Date prompt to the PPM Project Commitment Details report.